Queen + Adam Lambert (sometimes referred to as Q+AL or QAL) is a collaboration between the active members of the British band Queen (Brian May and Roger Taylor) and American vocalist Adam Lambert. As with all other Queen performances since 1997, longstanding bassist John Deacon has declined to participate in the project due to his retirement. This is the first long-term collaboration of Queen since the Queen + Paul Rodgers project ended in 2009. The collaboration originated when May and Taylor appeared on American Idol in 2009 when Lambert was a contestant. They began performing occasionally in 2011, conducted a short European tour in 2012, and in 2014 announced a world tour, the Queen + Adam Lambert Tour 2014–2015 with dates in North America, Australia, New Zealand, Asia, Europe and South America. In the summer of 2016, the group performed several dates as part of a festival tour in Europe and several dates in Asia. The next year, the group announced a second worldwide tour scheduled for 2017 and 2018. Joining May, Taylor and Lambert are long-time Queen touring keyboardist Spike Edney, bassist Neil Fairclough and percussionist Tyler Warren. Although there are currently no plans to release a studio album with this lineup, May and Taylor have stated that there is a possibility of the group recording original material. Queen and Lambert first performed together in 2009 when Queen members Brian May and Roger Taylor appeared as guests on the eighth season of American Idol on which Lambert was a contestant. On the show, Lambert and the eventual winner Kris Allen performed "We Are the Champions" together with the band. Soon after the finale, May indicated to Rolling Stone that he was considering Lambert as a frontman for Queen. May later revealed that he became interested in Lambert as a replacement for Paul Rodgers after watching a video of Lambert's audition for American Idol where he performed "Bohemian Rhapsody". In November 2011, Lambert joined Queen for a performance at the MTV Europe Awards in Belfast where Queen received a Global Icon Award. 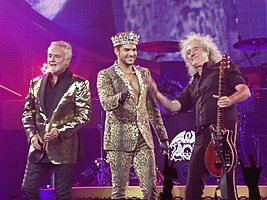 It was then reported in December 2011 that Taylor and May had begun discussions with Lambert for him to front Queen in concert. On 30 June 2012, Queen + Adam Lambert played their first full concert at Kiev's Independence Square for a joint show with Elton John in aid of the Elena Pinchuk ANTIAIDS Foundation. After their first performance in Kiev in 2012, a Queen + Adam Lambert mini-tour followed with dates in Moscow, Wrocław, and London. In September 2013, they appeared as a headliner at the iHeartRadio Music Festival in Las Vegas. In March 2014, they announced a 19-date Queen + Adam Lambert North American tour in the summer of 2014, which was then extended to 24 dates. In May 2014, tour dates in Australia were also announced, followed by New Zealand. The band also performed in South Korea and Japan. The tour was then extended to 2015 with dates in Europe and the UK as well as South America. Queen + Adam Lambert 2016 Summer Festival Tour started on 20 May 2016 in Lisbon, Portugal and ended on 30 September 2016 in Bangkok, Thailand. ^ "Queen Hint at Recording New Material with Adam Lambert". Ultimate Classic Rock. ^ "Kris Allen, Adam Lambert Tear Up Queen's 'We Are The Champions'". MTV News. ^ Brian Hiatt (22 May 2009). "Exclusive: Queen's Brian May Addresses Adam Lambert Rumors". Rolling Stone. ^ Jon Wiederhorn (6 March 2014). "Adam Lambert Reveals He Discovered Queen Through 'Wayne's World'". Yahoo Music. ^ Shirley Halperin (6 November 2011). "MTV EMAs: Adam Lambert Performs With Queen". The Hollywood Reporter. ^ "Queen + Adam Lambert? Roger Taylor Talks Possible Live Dates". Billboard. 6 December 2011. ^ Lyndsey Parker (12 July 2012). "Queen + Adam Lambert Rock London With "Queenbert" Concert". Yahoo! Music. ^ Lyndsey Parker (14 June 2014). "They Are the Champions: A Queen + Adam Lambert Timeline". Yahoo! Music Reality Rocks. ^ Jason Newman (6 March 2014). "Queen and Adam Lambert to Reunite for Summer Tour". Rolling Stone. ^ Dan Hyman (20 June 2014). "Queen and Adam Lambert's Tour Opener: 5 Things We Learned". Rolling Stone. ^ "Queen and Adam Lambert Announce 2014 Australian Tour". ARIA charts. ^ "Queen with Lambert announce NZ show". stuff.co.nz. 17 July 2014. ^ David Renshaw (29 September 2014). "Queen and Adam Lambert announce 2015 UK arena tour dates". NME. ^ "Press Release: Queen + Adam Lambert Announce 25 Date North American Tour". QueenOnline.com. 26 January 2017. ^ "Adam Lambert and Queen to tour Germany and Italy in 2018". Digital Journal. 3 February 2018. Retrieved 3 February 2018. ^ "Upcoming Shows". QueenOnline.com. Retrieved 3 February 2018. ^ "Press Release: Australian Dates Announced!". QueenOnline.com. Retrieved 8 April 2019. ^ "Press Release: New Zealand Shows Added!". QueenOnline.com. Retrieved 8 April 2019. ^ "QueenOnline.com - News". www.queenonline.com. Retrieved 17 April 2019. Queen + Adam Lambert have appeared on a number of television shows. On 30 November 2014 they performed "Somebody to Love" with the X Factor contestants joining in the final chorus. The band performed two songs on the Christmas special of the Helene Fischer Show [de] on German television. One of them was "I Want It All" and the other was "Who Wants to Live Forever" which was a duet between Lambert and Helene Fischer. The band performed a special concert, Queen & Adam Lambert Rock Big Ben Live, which was broadcast live on BBC One on New Year's Eve 2014 and into New Year's Day 2015. The concert was performed in the shadow of Big Ben in Central Hall Westminster, and the show paused for the chimes of the Big Ben in the New Year countdown and the firework display in London. In February 2017, the band appeared on The Late Late Show with James Corden where Corden and Lambert have a sing-off to determine who the better Queen frontman would be. In June 2017, they also made an appearance for Jimmy Kimmel Live!, where they performed multiple songs during a live concert sponsored by Mercedes-Benz. Queen + Adam Lambert announced a 10-date residency at Park Theater in Las Vegas in September 2018. They also performed at the 91st Academy Awards on February 24, 2019. ^ Jeff Benjamin (1 December 2014). "Watch Adam Lambert & Queen Slay "Somebody to Love" Live on 'X Factor'". Fuse. ^ Michel Imhof (25 December 2014). "Das erwartet dich in der "Helene Fischer Show"". Blick am Abend. ^ "Queen and Adam Lambert performed a New Year's Eve concert broadcast on BBC One called Queen + Adam Lambert Rock Big Ben Live". BBC. 1 December 2014. ^ Kate Mossman (26 December 2014). "Queen's Christmas message: "We need a change of government"". The Guardian. ^ Liam Martin (1 January 2015). "New Year's Eve Fireworks watched by 12 million on BBC One". Digital Spy. ^ "Queen + Adam Lambert To Rock Las Vegas". QueenOnline.com. Retrieved 15 May 2018.